I’m a big fan of Engine 2. Way back when I first read Prevent and Reverse Heart Disease, and before Rip Esselstyn was the poster man for plant strong eating he is today, I was also a fan of “The Esselstyn Breakfast” in the recipe section of that book. It’s the basic template for what is now famously known as “Rip’s Big Bowl.” I’ve long made my own simpler gluten-free version which doesn’t use any boxed cereals at all, with a rotating cast of fruity characters. Nothing could be simpler, or healthier. So I was a bit surprised to see that now you can buy the whole shebang in a box. At the risk of sounding a little like Gilda Radner’s character Emily Litella on Saturday Night Live’s Weekend Update, what’s all this about Rip’s big hole in his socks? It’s serial obscenity! And we are too lenient!! Emily Litella would rant on like this until Chevy Chase would tap her on the shoulder repeatedly to get her attention and correct her.No, he’d say. It’s an amenity. It’s convenient. And it’s breakfast cereal in a box. But I heard it right the first time. And still can’t resist just the tiniest of rants. I know people are busy, but come on. How long does it take to throw raw oats in a bowl and cut up a banana and pour almond milk and cinnamon over them? I rest my old-fashioned case. Mash the banana half in the bottom of your cereal bowl. Pour the busckwheat groats and rolled oats on top of it. Sprinkle with spices. Cut up the pineapple and put it in the bowl. Add the berries. Add the almnd milk and water. Stir up. Cover with a small plate and place in the fridge. Go do something else for a little while: check e-mail, wash your face, take a shower, water the garden. Take the bowl out of the fridge. Top with the heaping teaspoon of flax seed. Eat, chewing well. Enjoy each bite. If you’re needing to be extra strict about losing weight, it might matter to you that the raw oats in a “big bowl” are slightly more calorie dense than cooked oatmeal. But it’s all good, and all good for you, whichever way you go. Although I wish Engine 2 all the best with its launch of healthy packaged foods, in my humble opinion, you don’t need a prepackaged box. You just need the bowl. 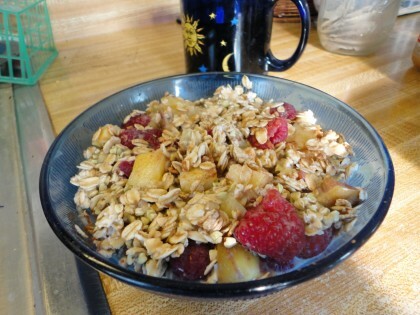 I’m so convinced about the basic goodness of oats I even included a sonnet about them in my chapbook if a sparrow. (I originally wrote this sonnet for a poetry contest on the Engine 2 site. I got a little too big for my britches, I guess, and thought for sure I’d be a shoe-in, but in the end the judges caved, saying everybody’s poem was good, and picked a winner randomly. It wasn’t me.) No worries. “Old Fashioned Oats” will appear in old-fashioned print this Fall. And you get to read it now. you grace my plain clear bowl with elegance. of peaches, the deep night sheen of berries. knows you welcome its brash buttered accents. presses a pale cheek to yours, like pearls on silk. You make us all look like a million bucks. Thanks, Rip, for the brilliant idea of the big bowl. To you and Engine 2, I raise my old-fashioned oat-filled spoon. 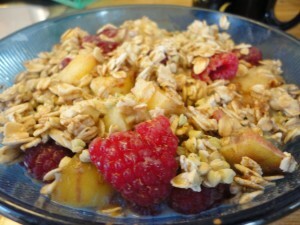 You can make this the night before but add your fruit and nuts in the morning! I make Overnight Oats with 1/3 cup oats, 1/2 almond milk, 1 tablespoon chia seeds, 1/4 teaspoon cinnamon, 1 teaspoon raw organic honey (or organic maple syrup), mix well refrigerate overnight and add berries or diced apple and 2 tablespoons of a mix of organic sprouted buckwheat groats and organic sprouted flax seeds, I also add chopped raw almonds or walnuts. The possibilities of what you can add are endless, how about a tropical bowl with pineapple, shaved coconut and hazel or brazil nuts? Yummy! Hi Leslie and welcome! Thanks for your comment. Yes! You can totally do it that way!! I used to make Overnight Oats all the time, based on a recipe from Lorna Sass in Short Cut Vegetarian. I just got into doing it this way, and it works for me. Yours sound yummy too!! I agree, the possibilities are endless! Thanks, Susan!! I had a lot of fun writing the poem and also pretending to be Gilda Radner!! So “cool” you happened to have oatmeal this morning. 🙂 You made me laugh about my elaborations, because I always believe my bowl of oats or a salad is going to be less elaborate, but once I get into it I can’t help creating an “assemblage”of art I can eat!! LOL 🙂 That is so fantastic you got to use your own blueberries. I would love to be able to say that!! One question for you re the buckwheat groats…they don’t require rinsing ? Boy, have I been wasting a lot of time then. Can’t wait to try this, ~THIS way! My hubby and I make our own version of Rips Big Bowl as well and we just love it. For a recent road trip we measured everything out into individual baggies and took it with us as well as our own almond milk, paper bowls and plastic spoons so we could start each day off right! Deffinately mash the banana first! I’ve been doing this for years, also! YUM! One day I was too hungry or hot to cook the oasts, and voila! raw oatmeal! Love your poem! Hello, would you mind terribly is I printed this out and framed it to hang in my kitchen. Oats has been such a blessing to me and I would be lost without it. Love your poem! I am with Susan and got a tickly out of your Gilda skit! I have been vegan know for a year. Fell off for a few months but back again and really thrilled to have these wonderful blogs to motivate me! However, I have never heard of groats. Does it taste like oatmeal? Is it easily found? TY. Thanks, Marge, you made me laugh with the “#fail”– that is something my son would do. 🙂 Thanks for ranting with me! !